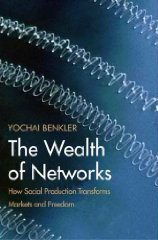 I’ve just started reading Yochai Benkler’s acclaimed The Wealth of Networks – a book I’ve been meaning to catch up with for some time. The full text is available through the Books Unbound site; a free digital initiative from Yale University Press. You can also download a PDF version from the wiki site. This entry was posted on Wednesday, January 21st, 2009 at 2:11 pm and is filed under Posts. You can follow any responses to this entry through the RSS 2.0 feed. You can leave a response, or trackback from your own site.